Charging an electric car away from home can be an exercise in uncertainty—hunting for that one lonely station at the back of a rest-area parking lot and hoping it's working. In Europe, some of the biggest automakers are out to remove such anxieties from the battery-only driving experience and encourage electric-vehicle sales by building a highway network of fast charging stations. The idea is to let drivers plug in, charge in minutes instead of hours, and speed off on their way—from Norway to southern Italy and Portugal to Poland. 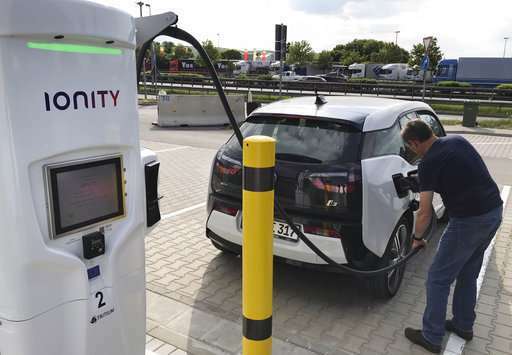 Despite a slower-than-expected start, Ionity CEO Michael Hajesch told The Associated Press in an interview he's "confident" the company will reach its goal of 400 ultra-fast charging stations averaging six charging places each by 2020. The idea is "to be able to drive long distances with battery electric vehicles, across Europe and to have the same experience at each station, meaning a very easy and comfortable customer journey," Hajesch said, speaking at the company's Munich headquarters near the 1972 Olympic stadium. 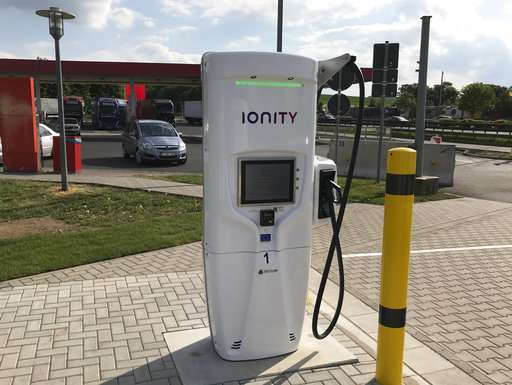 Ionity opened its first station April 17 at a rest stop off the A61 highway near the small town of Niederzissen, 50 kilometers (30 miles) south of Bonn in western Germany. The six high-speed chargers are operating in "welcome mode," meaning they're free until May 31. After that, Ionity plans to charge for the power, which it seeks to obtain from renewable sources. "It was right next to the highway, there was one charging station and we were lucky that it was free," he said. But he couldn't find a charging station he could use by the seashore. Volkswagen, which agreed to invest in low-emission driving to settle charges it cheated on diesel emissions, is building 300 highway charging sites in the U.S. by June 2019 through its Electrify America unit. Japan has 40,000 charging points, exceeding its 34,000 gas stations, according to Nissan—but many of those are private garages. 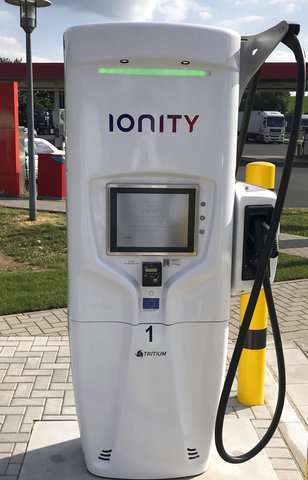 Ionity is counting on the large 350-kilowatt capacity of its publicly available chargers—almost three times the 120 kilowatts per vehicle of Tesla's Superchargers. No car currently on the market can make full use of 350 kilowatt charging capacity. 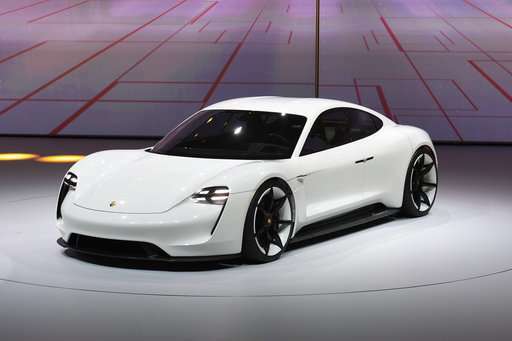 But they're coming: in 2019 Porsche plans to introduce the Mission E. Porsche says that the sleek, low-slung sports car will take 15 minutes to charge for 400 kilometers (250 miles) more driving. The automakers "are late, but it's better than it was... it remains the case that without Elon Musk the carmakers would not have realized this," he said. On the way back, he was able to charge at a rest stop, but only by asking a non-electric car owner to move his vehicle away from the lone charging pole. That's one of the fundamental limitations of the charging infrastructure. You still have to -park- the car by the charger, rather than just top up and go. In a charging station - even with multiple outlets - you can expect to wait for hours because there's a high probability that people are on the move and needing to charge up at the same times - like holiday weekends. A regular petrol station with 8 pumps would go through 20 customers in 10 minutes. To make a comparison, a regular car goes about 100 km on 6 liters of fuel, so 12 liters is enough to match the common electric car. That's 100 kWh of energy in little over 2-3 minutes, which makes the "charging power" of the gasoline pump some 2 Megawatts. To make the comparison equal to the electric car, divide by three. You get about 700 kW. So, turns out, the 350 kW Ionity charger is half as fast as a petrol pump, in theory. The limitation is the battery which can't accept the charge. The charging rate is relative to the battery capacity, not the outlet power - a small EV with a 30 kWh battery is going to charge three times slower than a big EV with a 100 kWh battery given the same cell type. An additional hurdle is that lithium batteries can't charge below 0 C, so additional time/energy must be spent to heat up the mass of batteries in case the car's been sitting outside in the winter. When you have 500 kg of batteries on-board, it takes a while. Unfortunately, the math just isn't in Tesla's favor. Chargers are more expensive to install than gasoline pumps, and since charging takes around 30 minutes compared to the 3-5 minutes to refuel, vastly more Superchargers would be needed to keep wait times low at peak times. Then there's of course the power demand of the chargers. A supercharger with 8 plugs giving out 120 kW each is drawing over a Megawatt from the grid, which is enough power to run a whole village (est. population 1,500). Multiply by the number of charging stations in all the villages, and you've got a serious issue delivering power to the charging network. The idea is to let drivers plug in, charge in minutes instead of hours, and speed off on their way—from Norway to southern Italy and Portugal to Poland. Well...Tesla has their supercharger network (and destination chargers) already set up in Europe. Nice to see that our Johnny-come-latelies finally got the memo and think they are now 'pioneering' a network. The amount of sugarcoating they are putting on their own failure to go with the times is breathtaking. "In a charging station - even with multiple outlets - you can expect to wait for hours because there's a high probability that people are on the move and needing to charge up at the same times - like holiday weekends." Nope. I can go all across the country in my Tesla with superchargers alone. The site three miles from my house has 20 charger slots. They are all FREE for my car. I have never waited anywhere. Those without EVs are just jealous. "Then there's of course the power demand of the chargers. A supercharger with 8 plugs giving out 120 kW each is drawing over a Megawatt from the grid, which is enough power to run a whole village (est. population 1,500). Multiply by the number of charging stations in all the villages, and you've got a serious issue delivering power to the charging network." Good observation, but it is not a problem. For one, they do not always provide 120 kW. The draw is determined by the car, and its needs, and as it charges, the rate drops. For another, it is seemingly no problem for the utilities to provide the power. "A regular petrol station with 8 pumps would go through 20 customers in 10 minutes." Who cares? I can "gas up" at home for 4 cents/mile, and with a car which needs almost no maintenance. Go out and wait in line for costly, smelly and polluting gasoline. With the ICE comes emissions systems, injectors, lifters, crankshafts, chains, belts, lubrication systems, filters, the need for fluid changes, oil leaks, and the need for tune-ups and regular costly maintenance. My quiet car has the maintenance needs of a toaster. Just clean it out once an a while. Petrol and diesel cars are a nuisance especially after Volkswagens diesel fix, electric cars are smoother faster, quieter, more reliable. When did you have service your starter battery. There is only one problem with an electric Volkswagen Tiguan's is its battery capacity and charging time, well what did you think electric cars were, there the existing cars we drive with their IC ripped out replaced with an electric motor - We still want and need Tiguan's because they are easy to get in and out with total hip replacements and the like. If the battery is overheating it is not the battery, it is the motor drawing a higher currant than the battery was designed to deliver.